The aim of this network is to provide a forum for Health Professionals to share information. Ideally, this is at a meeting, where you can talk face-to-face, and find out what is happening with your colleagues in other fields. The French scientist Louis Pasteur said "in the field of observation, chance favours only the prepared mind". Discussion of problems in healthcare with one's contemporaries, whether those problems are clinical or administrative, not only opens up opportunities for cooperation, but it helps us all to be realistic on what is, or what is not, possible. Being able to ask a lecturer for their opinion can be quicker than reading up on it, and is a fast-track way to gaining knowledge. 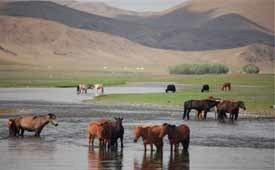 Mongolia is a large country, and it is not always possible to attend meetings in UB. To that end, we have posted details of all the past meetings, and included the educational lectures, including some power-point presentations. Healthcare is very complex, and no country in the World is completely satisfied with its own healthcare provision. Please use the website to share your opinions.